Nitrilase is the member of carbon–nitrogen hydrogen hydrolase superfamily, which has been widely used for the hydrolysis of nitriles into corresponding carboxylic acids. But most nitrilases are plagued by product inhibition in the industrial application. In this study, a “super nitrilase mutant” of nitrilase with high activity, thermostability and improved product tolerance from Acidovorax facilis ZJB09122 was characterized. Then, an efficient process was developed by employing the whole cell of recombinant E. coli for the conversion of high concentration of 1-cyanocyclohexylacetonitrile-to-1-cyanocyclohexaneacetic acid, an important intermediate of gabapentin. Under the optimized conditions, the higher substrate concentrations such as 1.3 M, 1.5 M and 1.8 M could be hydrolyzed by 13.58 g DCW/L with outstanding productivity (> 740 g/L/day). 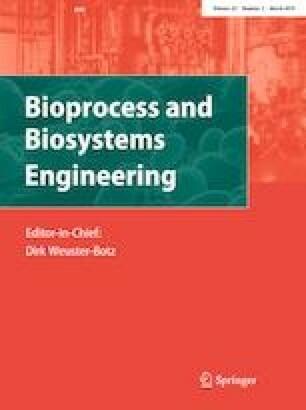 This study developed a highly efficient bioprocess for the preparation of 1-cyanocyclohexaneacetic acid which has the great potential for industrial application. This work was funded by the National Natural Science Foundation of China (nos. 21476210 and 21706235).